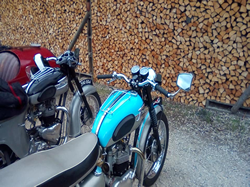 Afternoon Tea Ride In 9th September 2018. 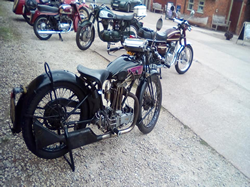 Among the assembled motorcycles at the Yew Tree Farm Tea rooms were two Vintage AJS's, two Triumph's, a Norton, a Royal Enfield, a Honda and a Morgan. 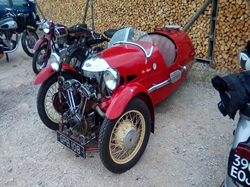 Their riders and passengers all came to sample the tea, coffee and assorted cakes on offer at this delightful location and make the best of the fair weather. This lovely afternoon was enjoyed by us all. Our thanks go to Simon Dudfield for organising this late summer social.